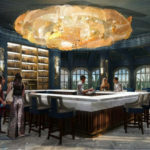 Will you change where you order a breakfast sandwich? 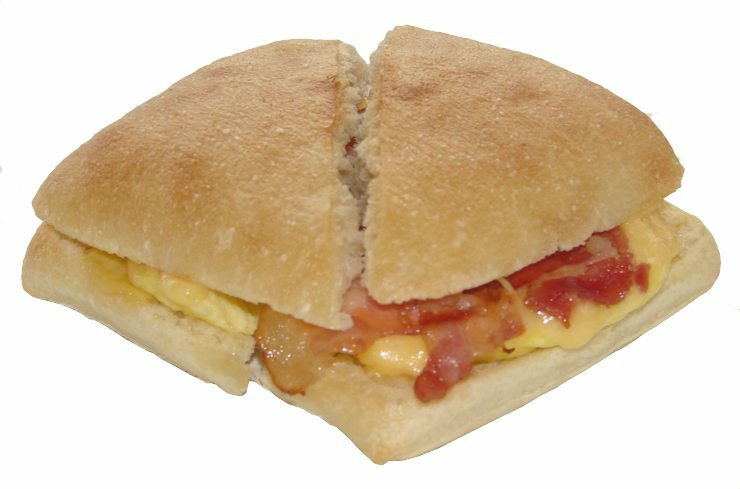 When you order a breakfast sandwich from your favorite fast food restaurant, the “eggs” in it might contain a lot of other ingredients too. 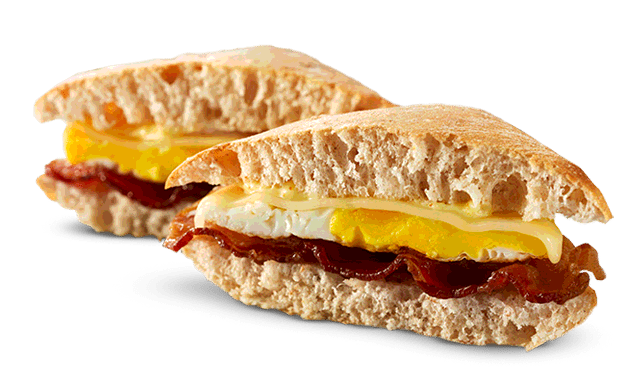 Panera claims that while working to expand its breakfast menu, the company discovered that the U.S. Food and Drug Administration did not have “a clear definition for the term ‘egg. 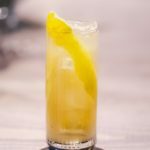 '” Because of this, the restaurant chain has petitioned the FDA to define what “egg” means for restaurants. 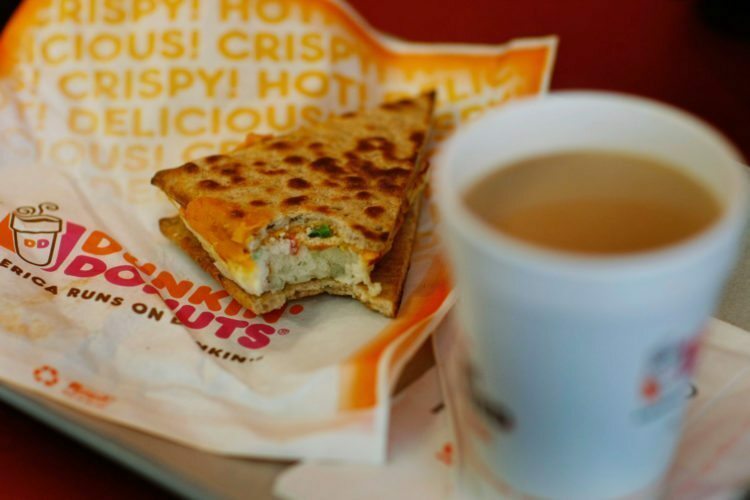 Burger King’s breakfast menu has an assortment of egg sandwiches and burritos on offer. 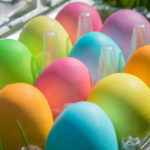 Its ingredients list says the egg product it uses is a “liquid egg—pasteurized mixture” that contains whole eggs, water and “2 percent or less” of the following: salt, xanthan gum, citric acid, annatto (color) and butter flavor (sunflower oil, natural flavors, medium chain triglycerides. 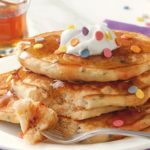 One of the chains that Panera took aim at, Chick-fil-A serves breakfast sandwiches with an egg product that contains similar ingredients as Burger King’s: whole eggs, water, as well as “2 percent or less” of the following: salt, natural butter type flavor (medium chain triglycerides, coconut oil, natural flavors), xanthan gum, citric acid and annatto (color). 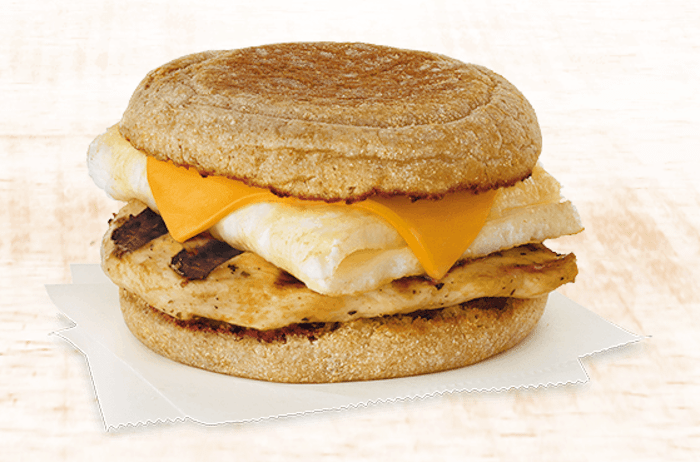 If you want something less processed, the egg on Chick-fil-A’s Egg White Chicken Grill contains only egg whites. 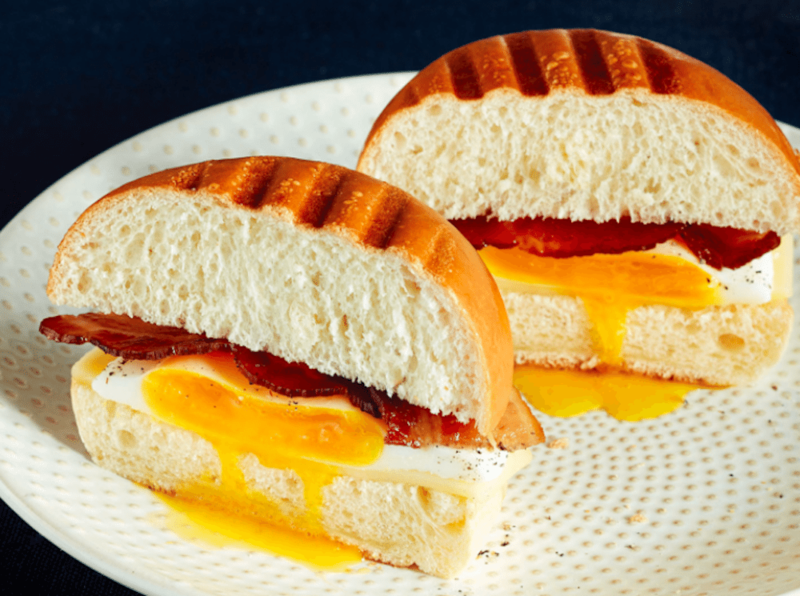 The egg sandwiches at Dunkin’ Donuts are probably healthier than the doughnuts—but they still have some complicated eggs. The egg patty used in items like the Sweet Black Pepper Bacon breakfast sandwich contains egg whites, egg yolks, soybean oil and water, as well as “2 percent or less” of the following: corn starch, salt, natural flavor, xanthan gum, cellulose gum and citric acid. The Veggie Egg White flatbread’s egg patty ingredient list is even longer: egg whites, Monterey Jack cheese (pasteurized milk, cheese culture, salt, enzymes, natamycin (preservative)), diced green peppers, diced red peppers, shredded potatoes (potatoes, dextrose, sodium acid pyrophosphate (preservative)), Swiss cheese blend (Swiss cheese (pasteurized milk, cheese culture, salt and enzymes), water, milkfat, sodium phosphate, lactic acid, salt, sorbic acid (preservative), natural flavors, sodium citrate, xanthan gum), modified corn starch, diced green onions, roasted mushrooms (mushrooms, canola oil, salt and pepper), cheese flavor (maltodextrin, whey solids, natural flavor and salt), salt, natural flavor, whole milk solids, soybean oil, dextrose with spice extractive and xanthan gum. The scrambled eggs contained in Jack In The Box’s breakfast burritos have a much longer ingredient list: whole eggs, 19 percent water, egg whites, as well as “less than 2 percent” of the following: salt, xanthan gum, citric acid, annatto (color), natural butter flavor (sunflower oil, natural flavors, medium chain triglycerides). They are grilled with butter-flavored vegetable oil. Some of the company’s scrambled eggs contain: whole eggs, 19 percent water, egg whites, as well as “less than 2 percent” of the following: salt, xanthan gum, sodium phosphate, artificial butter flavor (soybean oil, butter, lipolyzed butter fat, flavors and artificial flavors), citric acid (preservative) and nisin preparation (preservative). They are grilled with butter-flavored vegetable oil. In its ingredient breakdown, Jack In The Box did not make clear which breakfast items contain which scrambled eggs of the two types listed above. 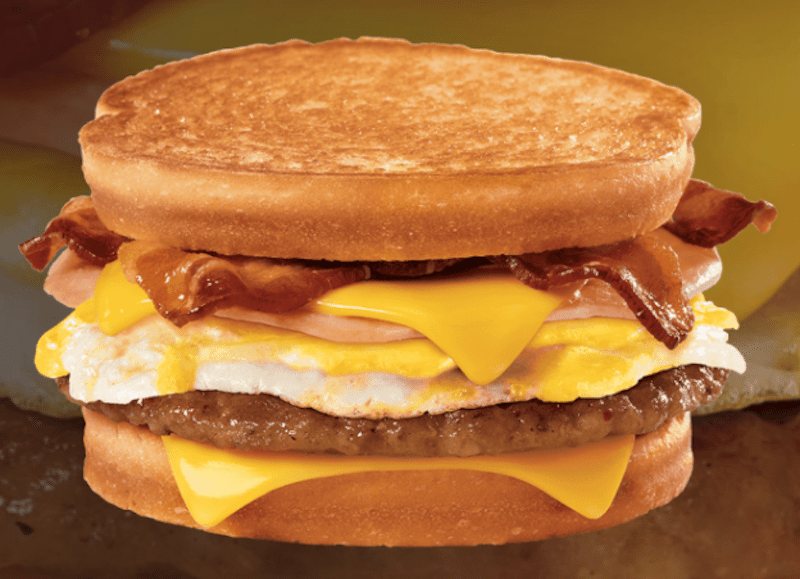 The popular McDonald’s breakfast menu has a number of sandwiches. The simple ingredients we found in all the company’s egg options are part of McDonald’s efforts to remove preservatives from many of its menu items. The classic Egg McMuffin and the Sausage McMuffin with egg both have a freshly cracked U.S. Department of Agriculture Grade A egg on them. The Egg White Delight contains pure egg whites. 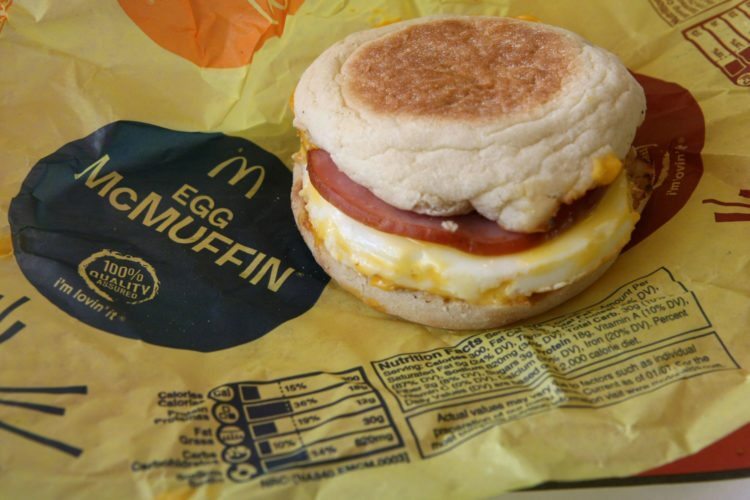 The “folded egg” found in the chain’s other breakfast sandwiches—like the Bacon, Egg & Cheese Biscuit, McGriddles and bagel sandwiches—contains eggs, nonfat milk, modified food starch, salt and citric acid. Scrambled eggs on non-sandwich breakfast items contain eggs and citric acid. Starbucks has several different pre-made egg varieties in its hot breakfast sandwiches—including the fried egg patty, frittata egg patty with cheese, scrambled egg patty, puffed scrambled egg patty, precooked scrambled eggs, egg white patty, caramelized onion egg patty and egg white omelet—and they each have individual ingredient lists. 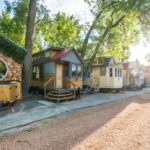 Click any of the links to see exactly what’s in each one of them. If you want fewer ingredients in your eggs, get either of the Sous Vide Egg Bites. The Egg White & Red Pepper variety contains only egg whites and the Bacon & Gruyere variety contains eggs and citric acid. 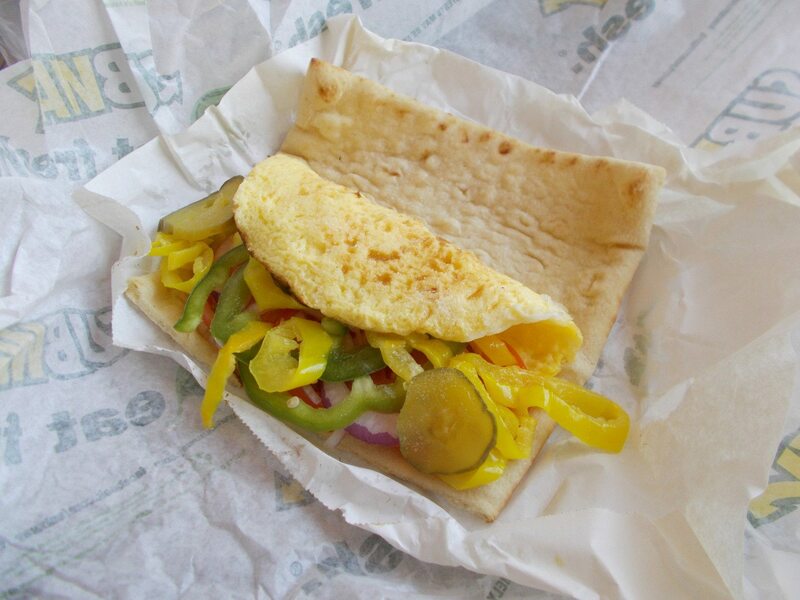 “Eat fresh” is Subway’s motto, but the long ingredient list for its breakfast flatbreads’ “egg omelet patty” seems pretty preservative heavy: whole eggs, egg whites, nonfat dry milk and water, as well as “2 percent or less” of the following: soybean oil, liquid butter alternative, liquid and hydrogenated soybean oil, salt, soy lecithin, natural flavor, tocopherols (vitamin E), corn starch, salt, xanthan gum, citric acid, white pepper and beta-carotene (color). The egg white version of the omelet patty has a somewhat simpler composition: egg whites and corn starch, as well as “2 percent or less” of the following: butter-flavored soybean oil (soybean oil, natural flavor), salt, xanthan gum and white pepper. 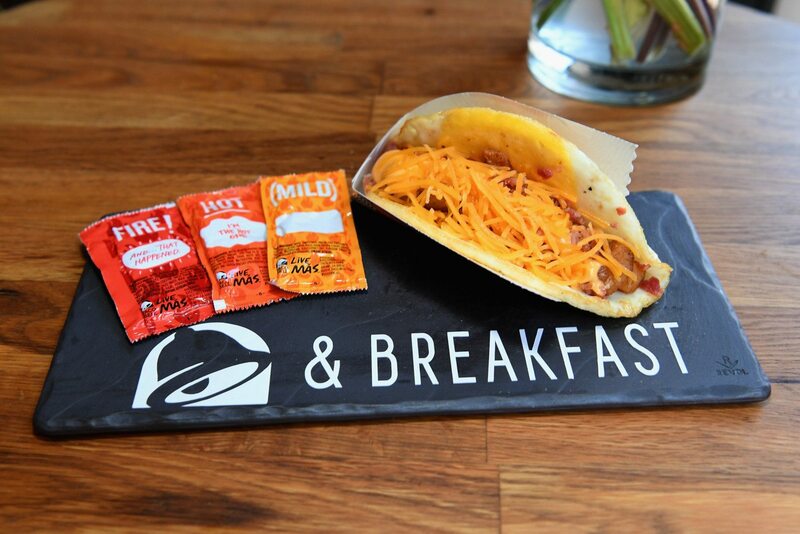 In addition to fries, Taco Bell still serves breakfast. According to its ingredient list, the chain’s eggs contain whole eggs, soybean oil, salt, citric acid, pepper, flavor (sunflower oil, flavors), xanthan gum and guar gum. The company also offers a Naked Egg Taco that has a taco shell made from a fried egg. That shell contains egg whites, egg yolks, soybean oil, water, food starch, salt, black pepper, natural butter flavor, xanthan gum, cellulose gum, citric acid and an additive called ethylenediamine tetraacetic acid (EDTA). The egg shell is prepared in canola oil. According to Wendy’s nutritional information, its Artisan Egg Sandwich, Fresh Baked Biscuit and Mornin’ Melt Panini each contain USDA Grade A eggs that are just that: egg with only soy lecithin (pan spray) alongside it. Wendy’s Sausage & Egg Burrito has scrambled eggs in it, which are a little more complicated. That contains: whole egg, whole milk and soybean oil, as well as “less than 2 percent” of the following: modified corn starch, salt, xanthan gum, citric acid. Those eggs are also seasoned with black pepper and sea salt. 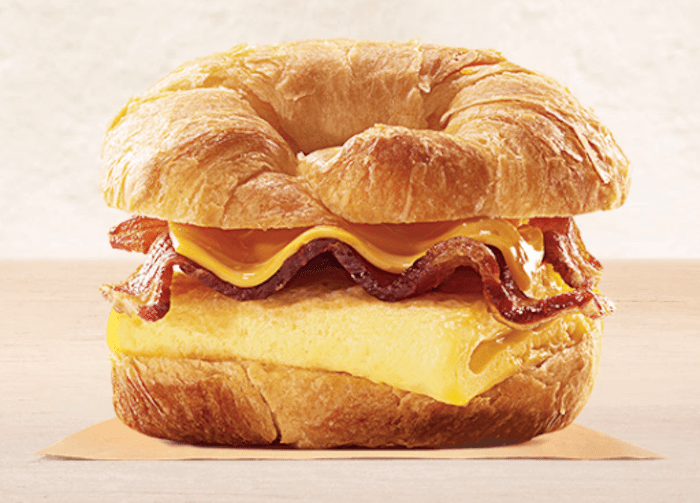 Now you just have to find a Wendy’s location that serves breakfast—because many don’t. In case you’re wondering what some of the dubious and complicated sounding ingredients listed above actually are, this Forbes article explains many of them. 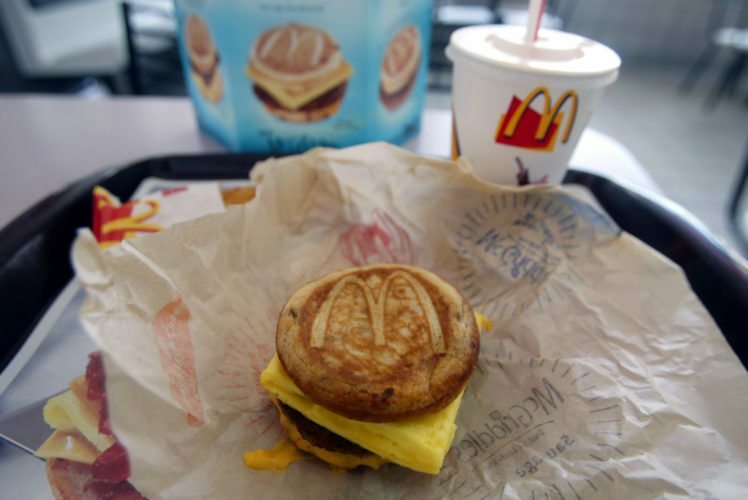 Does this make you rethink ordering any of your favorite fast-food breakfast sandwiches?